As costs rise and standards sink, helping clients get their educational moneys worth is a growing challenge. In a wink, kids zip from sporting booties and onesies to caps and grad gowns. But as college costs continue to soar, are parents saving efficiently for little Emma and Ethan’s higher education? Regrettably, many are not. And ultimately, often the only alternative is parents’ raiding their retirement savings to raise four years of college tuition. That now averages, for a private school, a whopping $134,600—not including room and board, transportation, books and equipment, according to The College Board. Clearly, this is a huge opportunity for financial advisors: Next to the retirement years, college funding is for many folks the largest financial outlay of their lifetime. “A lot of families fall flat-footed in addressing education-funding needs; so this is one of the biggest financial goals with which advisors can help clients. They should include it in their discussions every time they meet. It should be as natural as retirement planning—not something that will be a surprise to talk about later on,” says Tobias Henriksson, Raymond James education savings product manager until last February, when he was appointed regional vice president, Eagle Funds, RJ’s wholesaling subsidiary, based in St. Petersburg, Florida. College tuition rates are climbing an average 8% per year—much higher than the general inflation rate—partially paying for more college staffing not directly involved with instruction, more research and more intercollegiate athletics, among other nice-but-not-necessary services and activities. A variety of reasons are responsible for the ongoing increases. “The total number of kids in all higher-education is lower this academic year than three years ago. Enrollments are in a slow decline, and expensive liberal arts colleges with so-so reputations are fighting to get students. This is forcing colleges to obtain extra revenue. Increasingly, the weaker ones are accepting more lower-quality students than in the past because they’re hungry for tuition money,” says Richard K. Vedder, Ohio University economics professor and director of the Center for College Affordability and Productivity in Washington, D.C.
Embedded in most parents’ American dream is providing a college education for their children. But it is mistaken to assume that they must bear the entire expense themselves. 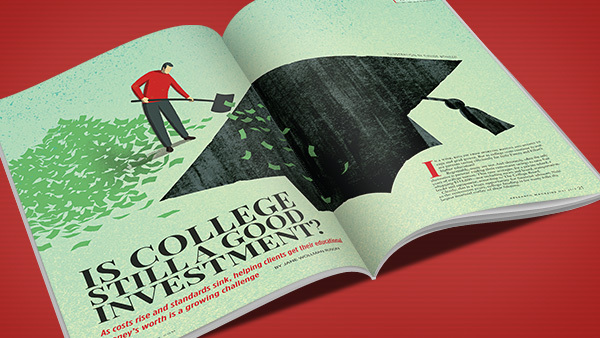 “For most people, college costs need to be funded from a variety of sources: 30% to 40% from parental savings; 20% to 30% from financial aid and scholarships; and the remainder from the student’s working or taking out loans on their own,” says Richard Polimeni, director of education savings, Bank of America Merrill Lynch, who is based in Pennington, New Jersey. Still, clients want to know how to reduce college costs, and advisors can shed light. Financial aid, of course is a major help. In most situations, it’s smart to apply for aid, even if it seems unlikely that funds will come through. “A lot of the time, families think they won’t qualify, that they’re beyond the level of being able to get aid,” says Cliff Goldstein, personal finance analyst at NerdWallet, based in San Francisco. Last academic year, more than $2.9 billion in available federal Pell Grant money was “left on the table” simply because families neglected to submit applications to receive aid, a NerdScholar study found. Unlike student loans, grants require no repayment. Merit scholarships are also available. High school students working for college credit is another way to get ahead of costs, generally chopping off a year of college attendance. One option growing in popularity is to attend community college—or even certain in-state public or private schools—for the first two years, then enrolling in a four-year college for the remaining two years to obtain a degree. Tuition at a community college can run a third to 50% less than at a four-year institution. Plus, with room-and-board costs rising dramatically, living at or near home the first years will save money too. A tuition-free college might be considered, if appropriate. There are a handful of them, including College of the Ozarks in Missouri and Berea College in Kentucky. Holding a full-time job to finance a college degree isn’t practical nowadays, but a student’s part-time employment could mean a significant dollar contribution toward tuition. Some financial-aid packages offered directly from schools are structured as work-study programs in which students hold on-campus jobs to partially pay for their financial aid. Surveys say that students today spend only 27.6 hours a week on academics—including classes, studying and exams—compared to 40 hours per week put in during the early 1960s. Certainly, some of current students’ free hours could be devoted to part-time work. However, some studies have found that many working part-time perform less well academically than those without jobs and that this leads to their quitting school. Distance education by computer is a lower-cost way to go, though, again, for less motivated students, the outcome often is their abandoning the program. Most parents maintain a by-hook-or-by-crook mindset when it comes to funding their children’s higher education; but the reality is that college simply isn’t for every student. To be sure, clients face a host of issues in connection with college planning; and FAs should not overlook this significant chance to help them. A 529 college savings plan (officially, a Qualified Tuition Program), created by Congress in 1996 and specifically designed for education savings, is considered the most effective vehicle compared to other education savings accounts. Five-twenty-nines cover tuition, room and board, books and computers. Their chief benefit is tax efficiency. Many plans have preset, professionally managed allocations and the flexibility of changing beneficiaries while keeping control of assets. To protect funds, many plans automatically shift from equities to bonds and cash as the child nears college age. Moreover, recent improvements make 529 plans even more attractive. In 2014, money in 529s grew by $20.8 billion for a record $247.9 billion, according to the College Savings Plans Network. Had more folks been familiar with 529s, that figure would even be substantially higher: 28% of parents said they didn’t know what a 529 was when responding to a 2014 T. Rowe Price survey. These plans are more effective for college saving than are UGMA/UTMA custodian accounts (Uniform Gifts to Minors Act/Uniform Transfers to Minors Act) or Coverdell Education Savings Accounts, also custodial. For example, a Coverdell ESA permits only $2,000 in contributions per year. A 529 surely beats borrowing against a 401(k) retirement plan or an insurance policy. Further, they’re far better for college funding than Roth IRAs, which are designed for retirement saving. One reason to avoid a Roth for education funding: “If a student applies for financial aid,” says Joe Hurley, founder of SavingforCollege.com, “a Roth can devastate eligibility,” because of the formula used to assess parent and student assets. In contrast, 529s pose little consequence in this calculation. During the financial meltdown, many investors became disenchanted with 529s as a result of plans’ use of mutual funds and tendency toward high expenses. Today, “they generally have very low expenses; so that’s not a complaint anymore,” says Hurley, based in Pittsford, New York. About 35 of the 80-to-85 different 529 plans available are advisor-sold. All others are sold direct to investors. The main message is: It’s never too soon to begin saving for college. “You really need to start early and plan ahead because if you wait till the kids are 12 or 13, there aren’t enough years to put the money aside,” Schon says. Alas, clients typically fail to bring up the subject of college planning with their advisors. It is therefore incumbent on the FA to do so and then work out a cost estimate. The next step is setting a funding goal—even if it isn’t the full amount. “Polimeni advises to “set a realistic goal and then discuss the best vehicle. In most cases, a 529 comes out the clear winner,” he says. Indeed, if advisors don’t broach the subject of college planning with clients, it likely won’t be discussed—until crunch-time. Richard K. Vedder is an economics professor at Ohio University, and director of the Center for College Affordability and Productivity in Washington, D.C. An adjunct scholar at the American Enterprise Institute, he is the author of “Going Broke by Degree: Why College Costs Too Much” (AEI Press 2004). Research: To what extent has financial aid helped students? Richard K. Vedder: They can borrow usually up to the cost of attendance. Federal student financial aid programs have absolutely exploded over the last several decades—and schools have been aggressive in raising fees knowing that students will be able to afford it, in some cases, going deeply into debt. So, rather than student loan programs helping students, they’re really helping the universities more in the form of higher tuition fees. This has helped finance an academic arms race, with universities trying to outdo one another with, for example, elaborate recreation centers with climbing walls and lazy rivers [water rides]. All this is adding to costs. What’s the current status of colleges’ academic standards? Over time, academic standards have declined dramatically, though you don’t see it as much at the elite schools. A lot of colleges with non-selective admission will take almost anyone who can pay the bill. Part of the blame is on the mediocre quality of K-through-12 education. Many students graduate from high school who in an earlier era would not have. What does a degree mean today compared to decades ago? A college degree used to be a really good device to screen out the best, the brightest, the hardest working from those with ordinary skills and work effort. Now a lot of college students are pretty ordinary in terms of knowledge, cognitive skills and work effort. Kids are now earning higher grades and working 30% less to get them. Close to 40% of kids who go to college don’t graduate within six years. What has been the impact of affirmative action? Affirmative action has had a negative effect on the quality of higher education. It’s a well-intentioned program with unintended consequences. A lot of minority students come from urban high schools that are horrible in quality. [But] we, sort of, entice them into college, and then we have extremely high drop-out rates among them. So what has been accomplished? How do the students feel? 14 Best Paying Jobs for College Business Majors: 2014.